Here's what to do with those ripe bananas - bake up a loaf of moist and delicious banana cake. 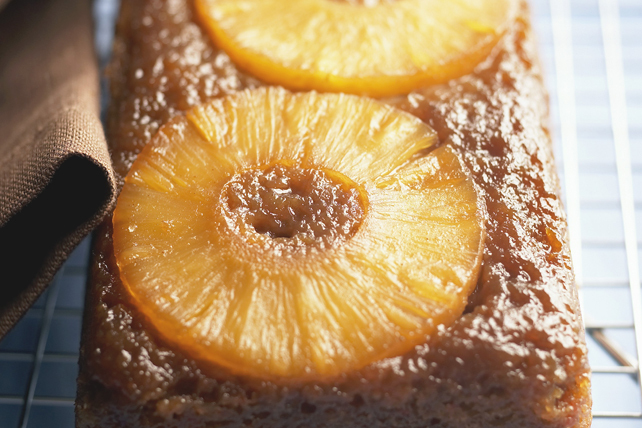 The pineapple slices add the perfect flavour surprise. Combine flour, baking powder and baking soda. Beat cream cheese, butter and granulated sugar in large bowl with mixer until light and fluffy. Add bananas and eggs; mix well. Gradually add dry ingredients, mixing after each addition just until blended. Line 9x5-inch loaf pan with parchment. Combine brown sugar and cinnamon; sprinkle onto bottom of prepared pan. Place pineapple rings in single layer over brown sugar mixture; cover with cake batter. Bake 1 hour 5 min. or until toothpick inserted in centre comes out clean. Cool 5 min. ; Invert onto wire rack; carefully remove pan and parchment. Cool cake completely. Place completely unwrapped measure of cream cheese in microwaveable bowl. Microwave on HIGH 15 sec. or just until softened. Store any leftovers in refrigerator up to 1 week before serving.